This Weeks Geek - Sentient Machines or Old Gods? We are so screwed.The Reapers have arrived, and with them marks the doom of all sentient races in the galaxy. 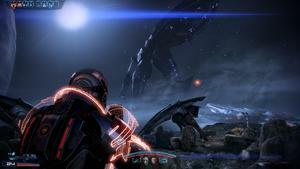 But what if their arrival had actually been foretold far before Shepard found the Prothean beacon on Eden Prime? What if there were texts that warned of a beast that would bring us to our end? What if we could have seen this all coming before we had even walked the stars? Now you may ask what other signs were already in existence? What could have possibly warned humanity of this terror? I speak of non other then HP Lovecraft, and his stories of Cthulhu. OK, sure, role your eyes, but give me chance here. Cthulhu is part of an older then we can imagine race of incredibly powerful entities from the stars. He has a large bulbous head spouting tentacles. He is even able to invade the thoughts of other races and make them go insane, or subvert them into working for him. There is even a story of Cthulhu's race waring with another before the dawn of man. Does this all sound familiar? Now lets look at a side by side, shall we? Sure there are some aesthetic differences, but Chtulhu was written about in 1928, 255 years before Sovereign attacked. The basic details are still there. A large head, the tentacles, sure Cthulhu had an actual body, but the human reaper would have had one two had Shepard not destroyed it. Their are too many similarities to discount this. Then I have to wonder though, would it have mattered? If humanity had taken the hints, if we had tried to warn the rest of the galaxy, would we have been taken seriously? No, we would have been laughed out of The Citadel, and then no preparations would have been made. This brings to one last question. 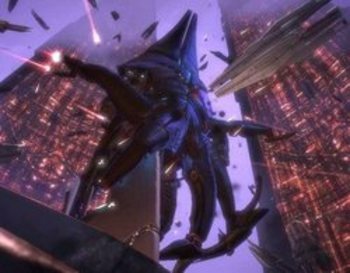 Are the Reapers the same race as Cthulhu, or are they his shepherd for this destruction of the galaxy?